Techno, Gender-free, and Bluesy Contras: Evolving Tradition? 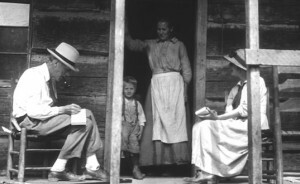 What is tradition? This question is relevant to all contra dancers, whether we realize it or not. The past several decades have witnessed somewhat of a contra revival, especially among youth and students. 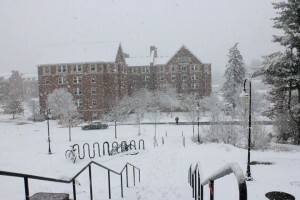 College dances have sprung up across the US, typically at smaller liberal arts schools, such as Oberlin (Oberlin, OH) and Hampshire (Amherst, MA) colleges. The increase in college-aged dancers has brought about a shift towards more progressive leanings, newer trends in musical tastes, and sexier dancing. 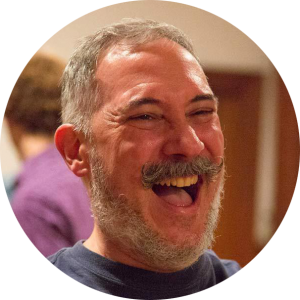 At the forefront of these changes are the use of gender-neutral terms in calling, the increasing number of techno contra dances, and the incorporation of “blues moves” into contra dancing, especially in the swing. 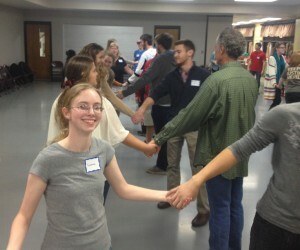 The emergence of trends like these within a folk tradition like contra dance, reflect the constantly evolving demographic of participants, and changes in popular culture and political/social culture. Gender-free contra dances have been happening since the 1970s. The push for non-gendered dances came out of the LGTBQ movement, and has grown steadily. 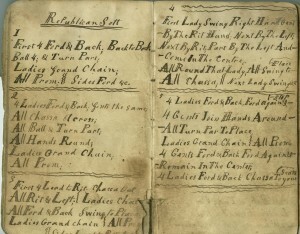 These dances promote experimentation with using non-gendered terms, such as lead and follow, or bare arms and arm bands, in place of the more traditional terms, such as ladies and gents. 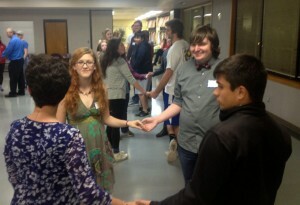 This change reflects the evolution of the understanding of gender and gender roles, and is a response to the traditionally binary gendered-nature of contra dance; an attempt to break away from the gender roles that society assigns us. 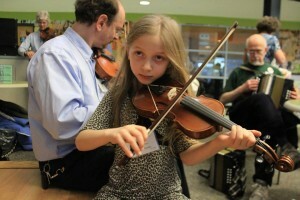 In the past decade or so techno contra, or crossover contra dances, have really taken off. 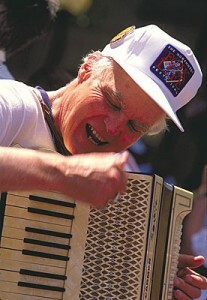 In 2001, Lisa Greenleaf, a Boston-area caller, first experimented with calling contra dances to prerecorded electronic music, in place of traditional, live bands. Since then, “techno” music has been increasingly incorporated into the standard dance circuit in the US. 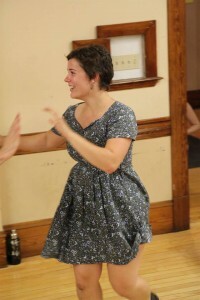 At the downtown Amherst, MA dance series, hosted most Wednesdays, there were ten techno contra dances alone in the past year! This reflects the increasing emergence of electronic, dub step, and techno music in popular musical production and consumption. 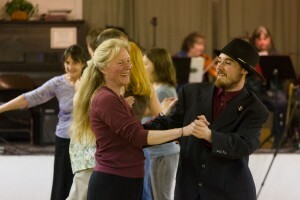 For years, swing dance accents have found their way into the stylistic choices of contra dancers. For example, during a partner swing, it’s common to see a variety of underarm turns and flourishes that come from the swing dance canon, and even the more complicated swing moves, such as sidecars (a difficult acrobatic lift move) or the pretzel (a complicated under arm flourish), can be seen occasionally on the dance floor. 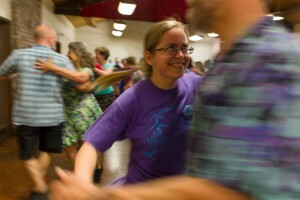 The boundary between the contra and swing dance communities has always been porous, so it follows that blues dancing (from the same era as Lindy Hop, but slower and smoother) moves also have slowly been incorporated into contra dance style. The blues posture is used frequently in partner swings, with typically a closer partner hold, and distinctly more intimate. 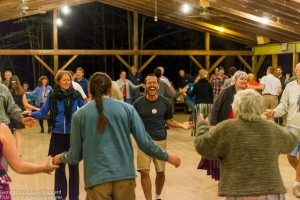 The Asheville, NC contra dance scene is regarded as a hotspot of dancers emulating a sexier, blues-fusion dance style, though blues moves can be seen in contra dances all over the country. 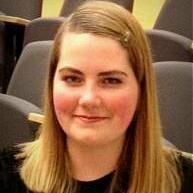 Abigail Hobart studies ethnomusicology, sustainability, and food systems at Hampshire College, where she also organizes a monthly contra dance series. 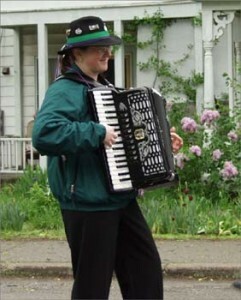 She is an avid contra dancer and lover of the tradition, and is from the Pacific Northwest. 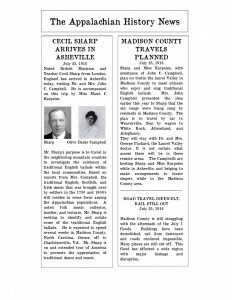 Guest bloggers on the CDSS page are welcome. Write to news@cdss.org for guidelines. 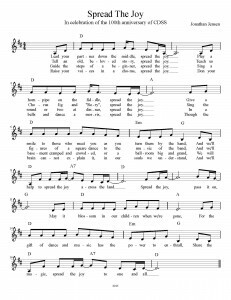 This entry was posted in American Dance, Beginning Dancers, Contra Dance, Dance Callers, English Dance, Features & Fun, Folk Dance, Guest Posts, Musicians, Old Time Dance, Round Dance, Square Dance, Traditional Dance, Traditional Music on May 13, 2014 by Lynn Nichols.